Right before the wise old wizard Drum Billet died, he passed on his magical staff of power to the newborn eighth son of an eighth son. Unfortunately, Drum Billet never bothered to check the gender of the newborn baby, and it turns out to be a girl. Now his chauvinistic colleagues are forced to deal with a young girl who has all the qualifications to join their all-male profession. 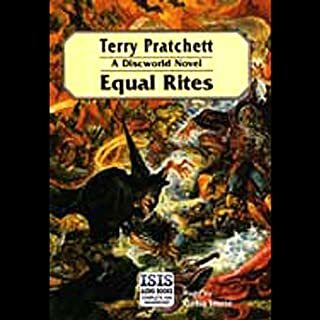 Terry Pratchett's third Discworld novel, Equal Rites, asks many provocative questions about magic, where it goes, where it comes from, and why. I'm regretting getting this as an audiobook because of how bad the audio quality is. You can hear static all throughout and the volume is not at all consistent. In some areas you can barely hear the narrator at all. I usually listen to books in the car on my long commute but I really struggled with this one because it was so hard to hear. Extremely frustrating! 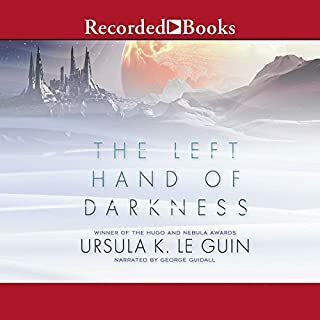 A lot of reviews complain about the narrator but I suspect the issue is mainly the audio issues combined with thinly veiled sexism. Her performance of Granny Weatherwax was spot on. From the previews I thought the narrator was a woman with a very clear voice but apparently that was only the forward. The actual narrator is a man who does not speak clearly. I listen to audio books on my very long daily commute and along with the road noise I couldn't understand the mumbling narrator at all. I returned this book and will buy a print copy instead.